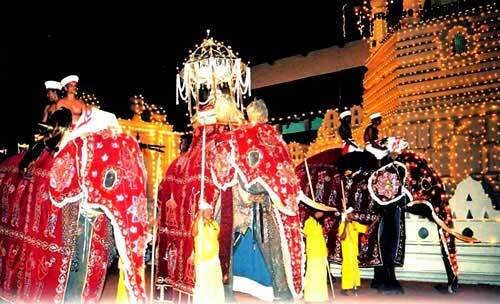 Old Ceylon Kandy Perahera – the Kandy Perahera originates with the arrival of Prince Dantaha and Princess Hemamala, the son-in-law and daughter of King Guhasiva of Kalinga in India to Sri Lanka during the reign of King Kirthisiri Meghawanna (305-331 AD). Following the decree of King Kirthisiri Meghawanna that the Relic should be taken round the city of Anuradhapura once a year, the Esala Perahera had been followed by the succession of kings, though with interruptions caused by foreign invasions. The most revealing narration of the Esala Perehera is found in the book written by the Chinese pilgrim ‘Fa Hien’ who visited Sri Lanka in the 5th century A.D. The sporadic invasions by the Dravidian Kingdoms resulted in the shifting of the seat of the kingdom from Anuradhapura to Polonnaruwa, then to Dambadeniya and thereafter to other cities. In each retreat, a new temple was constructed to enshrine the Sacred Tooth Relic. Finally, after the shift of the capital to Kandy, the Relic has been undisturbed. ever since and the Esala Perahera has been held annually to rejoice and honour the Sacred Tooth Relic. 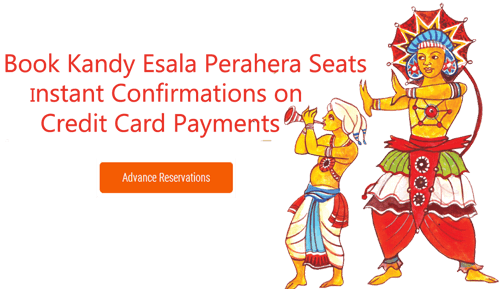 The Kandy Esala Perahera is believed to be a fusion of two separate but interconnected Perahera’s – The Esala and Dalada. It is a very grand affair with elegant costumes and is celebrated either in July or August depending on the Full Moon Poya Day. The Esala Perahera which is thought to date back to the 3rd century BC, was a ritual enacted to request the gods for rainfall. While the Dalada Perahera is believed to have begun when the Sacred Tooth Relic of the Buddha was brought to Sri Lanka from India during the 4th Century AD. The Kandy Perahera features five processions organized by the Sri Dalada Maligawa , which is the most venerated Buddhist temple of Sri Lanka and four shrines dedicated to Hindu Gods and a Goddess, i.e. the Shrine of God Natha, the Shrine of God Maha Vishnu, the Shrine of God Katharagama and the Shrine of Goddess Pattini. By 8pm, the Maligawa Perahera or the procession of the Sacred Temple of the Tooth takes the lead and are joined by the processions of the four Hindu shrines. The second procession is from the shrine dedicated to God Natha. The 14th Century shrine that faces the Sri Dalada Maligawa is said to be the oldest edifice in Kandy. The third is from the shrine dedicated to God Vishnu. The Vishnu Devale also known as the Maha Devale is located close to the Natha Devale. The fourth procession is from the Kataragama Devale dedicated to the God of Skanda, the deity of Kataragama. The Kataragama shrine is located along Kottugodalle Street of Kandy. This procession includes Kavadi, the peacock dance, in which pilgrim dancers carry semicircular wooden contraptions studded with peacock feathers on their shoulders. The fifth and final procession is from the shine dedicated to goddess Pattini. The Pattini shrine is located towards the west of the Natha Devale. At the forefront of the procession are the Whip Crackers. The cracking of whips all the way from the very beginning to end of the chosen path of Perahera signifies the approach of the procession. Immediately following the whip crackers are the Flag Bearers carrying standard flags and flags of the different Provinces and the Temples in single file on both sides of the road. The official called Peramunerala riding on the first elephant follows next carrying the register of the Sacred Temple of the Tooth at Kandy. Next on the procession are the Drummers playing an array of traditional drums and blowing traditional flutes. While the drummers play in explosive style, the teams of traditional dancers create magic with their leaps and moves. The hoards of drummers and dancers are followed up by the officer in charge of the elephants, of course mounted on a caparisoned and decorated tusker. During the ancient and medieval times of Sri Lanka, the officer in charge of the King’s stable had been a high ranking minister of the king. To date the officer in charge of the elephants called the Gajanayaka Nilame carries the silver goad called Ankusa that symbolize his authority. Following the Gajanayake Nilame is another officer of the temple mounted on a tusker: the ‘Kariyakorawnarala’, is the officer in charge of drummers and dancers. He is also responsible for minor functions at the Sacred Temple of the Tooth. Arrival of the Kariyakorawnarala sets the stage for the center of attraction: the Maligawa Tusker who is caparisoned, robed and illuminated, walks majestically in supreme grace and great pride carrying the resplendent golden casket called the ‘Karaduwa’ sheltered with a canopy. The golden casket contains the Sacred Tooth Relic of Buddha. The beast’s sense of the solemnity of the procession and the reverence in which the Sacred Tooth Relic is held could hardly be bettered even by a human itself. Held high over the Tusker is a canopy while the Tusker’s walking path is covered by a ream of white cloth called pavada. The devotees, spectators, foreign tourists and all distinguished guests stand steadfast while the Maligawa Tusker carrying the Sacred Tooth Relic of Buddha passes them. The Tusker is followed by two long chains of vibrant dancers, on each side of the road, facing each other with a team of drummers in the middle forming another column. At the end of the retinue is the Custodian of the Temple of the Tooth titled Diyawadana Nilame, dressed in traditional regalia of the high officials of kings, who reigned at the medieval kingdom of Kandy. Diyawadana Nilame is attended by Murawadu (lance bearers), Wadana tal-athu (sunshade bearers and umbrella-bearers) as well as the other officials of the Sacred Temple of the Tooth. The Five ‘Randoli’ Perahera’s are continued after the Kumbal Perahera for five consecutive days. Out of these Perahera’s the most beautiful and spectacular Perahera is the Randoli Perahera (golden palanquin). 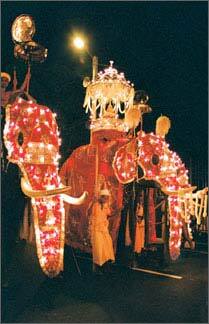 The city of Kandy is fulfilled with tourists and local spectators during this period. This is the only Perahera in the world which is held for ten days along with more than fifty Elephants and Tuskers, hundreds of drummers, dancers, singers and elegantly dressed pilgrims and spectators. After the final Perahera four Perahera’s from the four ‘devales’ head towards the steppingstones of the Getambe Mahaveli River near Peradeniya. The chief ‘kapuralas’ (priests) of the ‘devales’ then wade into the middle of the river. One of the ‘kapuralas’ marks a circle in the water with the point of a ‘golden’ sword. Then the priests’ empties the water into the river that is held in the ‘golden ewer’ (ran kendiya) which they had filled with water at the same spot the year before. Then they fill them up again with fresh water (The ewers thus filled will be emptied and refilled here at the end of The Esala Perahera the following year). This ritual is known as the ‘diya kapeema’ (water cutting), which takes place on the morning of the last day of the festivities. Then the four Peraheras start marching back to Kandy. On their way they stop at the ‘Pulleyar Kovil’ (Selvavinayagar Kovil) at Katukelle. Next at an astrologically calculated auspicious moment they proceed to the Adahana Maluwa, where they join the Maligawa Perahera. 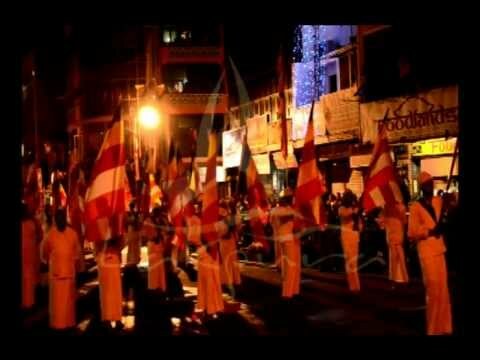 The five Peraheras parade along the D. S. Senanayake Street and King Street three times. Finally the Maligawa Perahera enters the Maligawa and the devale Peraheras wind up at their respective temples, bringing the annual Kandy Esala Pageant to an end.